The brain spawn are a race of big, flying brains who travel from planet to planet and destroy all sentient thought, which they hate, eventually eliminating the planet in question. They came into being milliseconds after the Big Bang. They have been at war with the Nibblonians ever since. The ultimate goal of the brain spawn is to gather all the knowledge in the universe. This ultimately leads to the construction of the Infosphere. 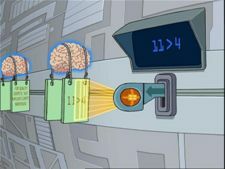 Once all information in the known universe is collected, the brain spawn intended to destroy the universe, to ensure that no new information would be created. The brain spawn cannot see; they only can detect the Delta Brain Waves of a sentient being. Their chief combat ability is to send out a stupefication field that eradicates all intelligence within the blast radius--presumably the field attacks the Delta Brain Wave itself. This makes Philip J. Fry the ultimate champion against the brain spawn, as he lacks the Delta Brain Wave and therefore can neither be seen nor fought by them. The brain spawn hate conscious thought for several reasons, among which is the fact that thought by others than themselves hurts them. This is one of their few weaknesses. Small Brains: Foot soldiers of a sort, but have huge numbers. Capable of stupefying an entire planet in a matter of hours. Big Brains: A sort of "General", more intelligent, capable of speech, and can trap beings in fictional worlds created from books. Huge Brain: Only one ever seen, capable of firing a beam that can instantly kill large dinosaurs. 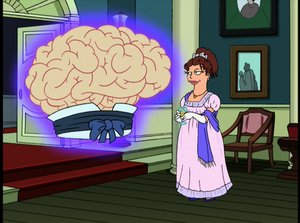 Fry appears to be referring to the brain spawn when talking to Michelle in "The Cryonic Woman"; as he had not actually met them yet, this was probably in reference to something else, such as the Spheroids. Some planets destroyed by the brain spawn are Space Rome, Don Martin 3, and Tweenis 12. The brain spawn are responsible for the destruction of the dinosaurs. It is unknown why the brain spawn are in the form of human brains, having come into being billions of years before the humans. As of yet, the brain spawn are currently the first known alien race to make contact with Earth (but not with humans). Their plan to learn information from different worlds and destroy them is similar to Brainac's motives from the DC Comics. The Big Brain: I'm a gigantic brain! The Big Brain: The big brain am winning again! I am the greetest! Now I am leaving Earth for no raeson?! Infosphere: Is that the Philip J. Fry from Earth or the Philip J. Fry from Hovering Squid World 97A? Big Brain: Earth, you fat idiot. Now hurry up! Fry: What really killed the dinosaurs? Brain: Our calculations are always correct, for we are gigantic brains. Brain: A Quantum Interphase Bomb? Are you insane in the membrane? This page was last edited on 27 September 2014, at 00:00.